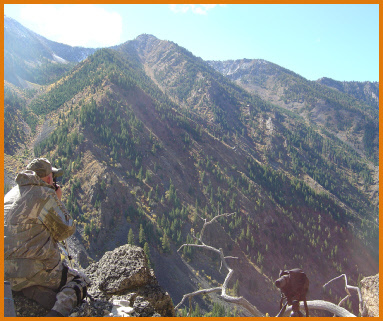 Bighorn Outfitters offers great elk and deer hunting, bear hunting, wilderness horse pack trips and vacations in the Bighorn Crags of Idaho for anyone who wants a wilderness experience. 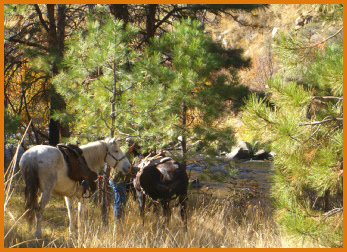 We have hunting, fishing, pack trips, camping, trail rides, and photography trips. Our hunting includes elk, deer, mountain lion, bighorn sheep, bear, predators, and game birds. The fishing is for rainbow trout, cutthroat trout, grayling, golden and brook trout. We have over 40 mountain lakes and fish by spin casting or fly fishing. Our trips can be tailored to your desires. You can explore, hike, hunt, fish or just relax and partake of the fine foods we provide. Idaho contains a vast amount of primitive wilderness. Bighorn Outfitters is permitted by the Idaho Outfitters and Guides Licensing Board, the Idaho Department of Fish and Game, and the Salmon-Challis Forest Service to make this prime hunting area with its wild game accessible to the public. As being the only LICENSED outfitter in the 275 square mile permitted area, Bighorn Outfitters provides a very high quality hunt using six to seven reserved wilderness hunting camps during the fall hunting season of September, October and November. Bighorn Outfitters now offers Spring Bear/Wolf Hunts. You can now harvest up to 2 black bears and 5 wolves. Click here for more information!